Bhartiya Gyanpeeth presented the award for his book 'Main hi Radha, Main hi Krishn'. Gulab Kothari, chief editor, Rajasthan Patrika Group was recently honoured with the 25th Moorthidevi Award by Bhartiya Gyanpeeth for his book 'Main hi Radha, Main hi Krishn' in the Capital during a ceremony. A scholar, writer and journalist, Kothari was presented with a cheque of Rs 4 lakh, a shawl and sreephal at the ceremony by the Lok Sabha speaker, Meira Kumar. Kumar lauded Kothari's contribution in enriching Indian literature. Speaking at the ceremony, Kothari said that one needs to have honesty of cause and Gyaan, meaning wisdom and vision, to allow the readers to enter the writers' thought process, as this is the only way to attain Krishna or Shabd Brahma. The programme was attended by several high profile dignitaries such as Vasundhara Raje Scindia, Girija Vyas, Dushyant Singh, Alok Prakash Jain and Ravindra Kalia. Earlier, Kothari has won several awards such as Bhartendu Harish Chand Award, Vishnu Tirth Award, Samaj Ratan Award, Nanda Foundation Award and others. Rajasthan Patrika is a 54-year-old company that started as an evening newspaper and is today one of fastest growing media conglomerates. It is the No. 1 Hindi daily in Rajasthan, and is also present in Gujarat, Karnataka, Tamil Nadu and Madhya Pradesh. It has a strong readership of over 1.5 crore in Rajasthan alone. 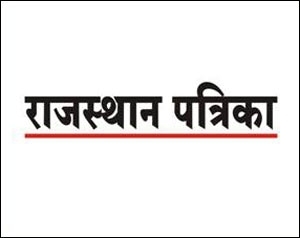 Rajasthan Patrika operates through 17 publishing centres across India.